100 Songs Excerpted for Successful Auditions. Edited by Michael Dansicker. Vocal Collection. Broadway, Movies and Pop. Songbook. 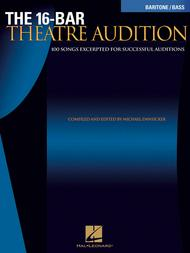 With vocal melody, lyrics, piano accompaniment, chord names and introductory text. 172 pages. Published by Hal Leonard (HL.740256). ISBN 0634064436. 9x12 inches. Compiled and edited by Michael Dansicker. Someone Like You From Do I Hear a Waltz? It Only Takes A Moment From Hello, Dolly! Once In Love With Amy From Where's Charley? She Touched Me From Drat! The Cat! not get to the part of the song that would be best for my audition. This not like i expected. but they are great for musical auditions i have used about 20 of them.